A New York Times Book Review Notable Book of the Year, as well as one of Publishers Weekly’s 100 Best Books of the Year, KATE garnered great attention upon publication, being serialized in Vanity Fair and the New York Daily News. “A corrective to the hagiography that has often been passed as her personal history,” wrote The Washington Post. Indeed, Mann’s portrait of the American icon differs from her public legend in many ways, not least of which was her steely determination to make it to the top and her obsession with staying there. And yet the book remains respectful and even affectionate toward Hepburn, the beloved movie queen and Connecticut Yankee. The real woman, as Mann points out, was far more interesting than the one-dimensional legend she fostered. 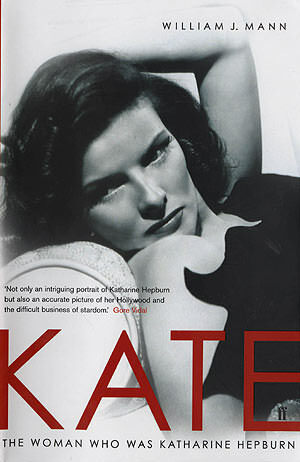 Katharine Hepburn was her own creation. She charmed the public with the image of an East Coast aristocrat, wearing pants and freely speaking her mind, and the image stuck. But that show didn’t come easily to her, or without tremendous effort and concealment. None of her success did. What lay beneath Hepburn’s public roles was an ambitious, vulnerable woman whose relationships and sexuality were never as simple as Kate–and previous biographers–suggested. With this biography, William J. Mann challenges much of what we think we know about the Great Kate, and shows how a woman originally considered too controversial for Hollywood stardom learned the fine art of imagecraft, and transformed herself into an icon as all-American as the Statue of Liberty.